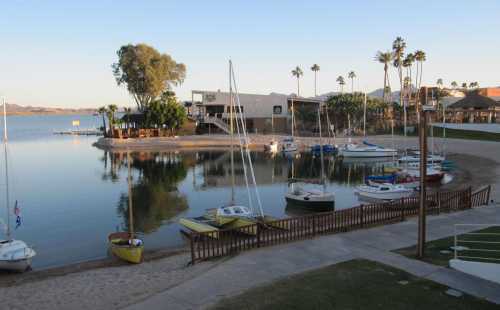 In February we drove to Lake Havasu Az, USA, home to the old London Bridge, and the HPCC, with our Strike 18 in tow. A 2820 mile round trip! 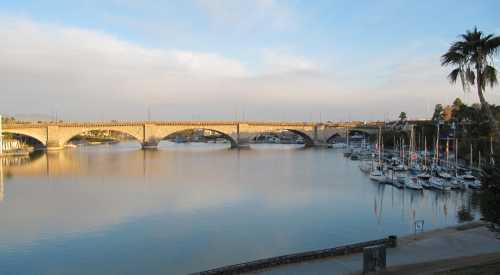 We had a great time, staying in a "Room with a View", see below. And it only rained twice! Actually rain was a surprise, as was the cold wind. Average yearly rainfall is 35mm (11/2in). We have been sailing our Strike in Canada for three years, yet this was the first time we ever had to reef. We have decided to have a Skoota 28 powercat built for our own use in the Pacific North West. 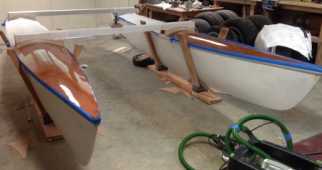 It is being professionally built in Sequim, Wa, photos will be posted when work has started. We spent a month touring the UK, primarily England and Wales, however we did drive north of Hadrian's Wall so we would have been in Scotland in Roman times. The day after our sail the weather changed, and from 20deg (70F) temperature snow fell and the wind blew, and many of the roads we had driven over a few days earlier were closed because of snow. 1980 miles driving, not as far as the Havasu trip, but even so, it cost a lot more in fuel, I'd grown too used to the very cheap fuel in the USA, so spending GBP100 (USD150) to fill the tank was a shock. Especially as 300 miles later we had to do it again. Josh took our first Skoota 28 hull out of his shed in Sequim, Washington, USA, in mid May, see video and photo below. More photos are on the Skoota powercats page. You can see how light the hull is, the 6 men are carrying it easily.The outer stem has yet to be fitted and the transom still has to be trimmed back (and the temporary frame removed). And sanding, filling and painting of course! 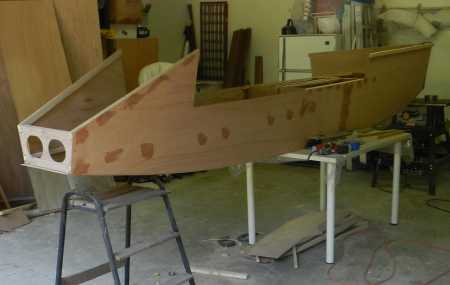 The second hull should be finished by early July. 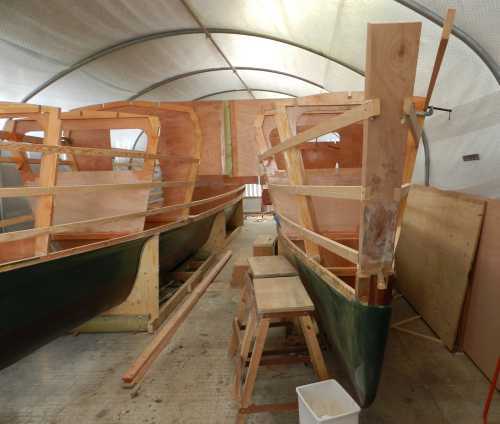 Then the central cabin will be made so hopefully the boat can be assembled while it is still good weather. Only then will it all be painted. We are very pleased with the quality of Josh's work. 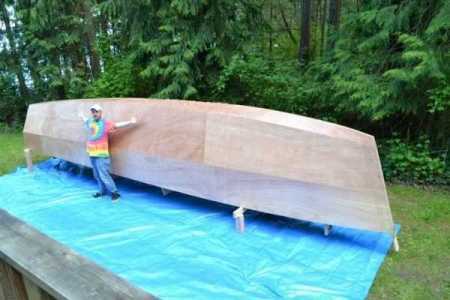 If you would like him to build your own wood boat please email me and I will pass on your request. We moved back to Canada for the summer May 1st and spent a few days refitting the Strike and launching it. 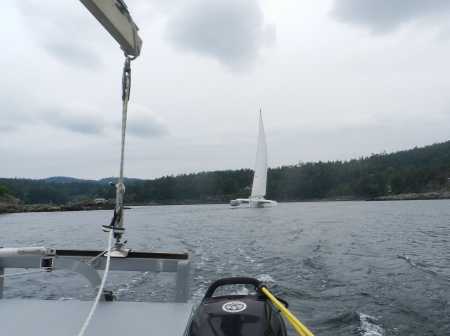 The first event in the BCMS calendar was on Pender Island, the next island to us. We raced our Strike in a light, but slowly building wind. 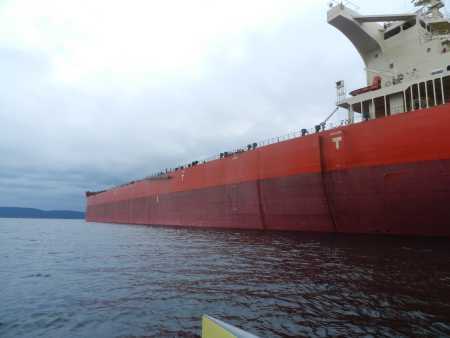 The normal triangular course was enlivened by having to do a loop round an anchored ship. We were, of course, by far the smallest boat. Even so after an hour racing we went round the lee mark just ahead of a Crowther 40 trimaran. They beat us home though. Still we had a good sail which is the main thing. And the rain held off, just, although Jetti was prepared. 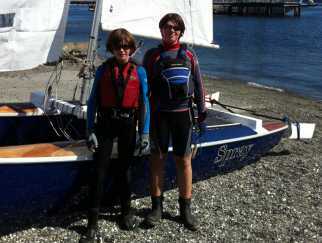 The Swiftsure Race, held over the last weekend in May is the biggest offshore race in the Pacific North West. Long time readers will recall that I raced on Bad Kitty a few years ago when we were first to finish. This year I was asked to helm Flying Kiwi, a 35ft Banks catamaran, in the inshore race. 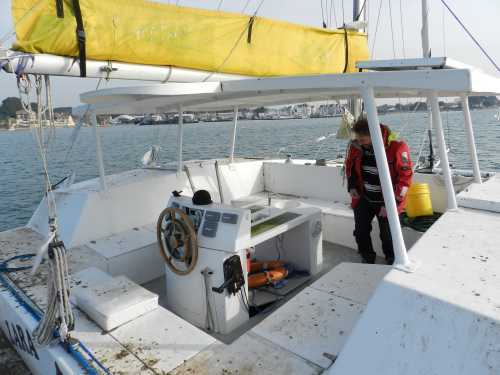 Flying Kiwi is a 30 year old boat, sailed on a budget. The genoa is original and the only dacron sail in the fleet, so usually it finishes near the back. 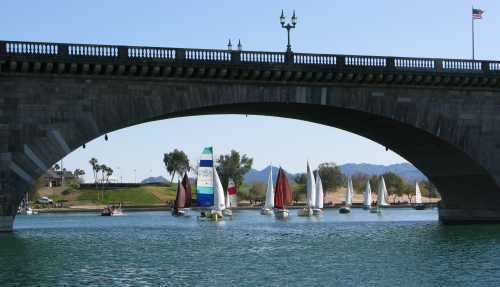 The start was postponed for 30 minutes due to lack of wind. When we did eventually start the wind slowly picked up to maybe 5 knots true. 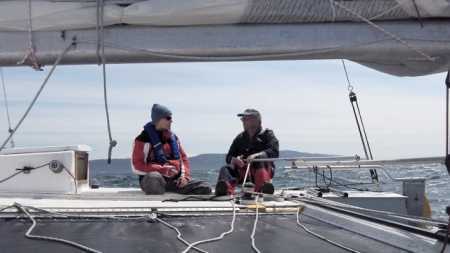 We had a 10 mile beat (actually we laid it on one tack, the tide helped) and rounded just behind the consistently best sailed boat in the PNW, "Geneva" a F24. On the run downwind we passed Geneva, but we only had a small symmetrical spinnaker and an even smaller asymmetric, so we were overtaken, temporarily, by a much modified Viva 27 racing catamaran. However we kept the F31, F27's at bay. You'll all groan, but I'll write it anyway. See below for the video. I just wish Tim had used his phone to upload the video as then it would have been a real podcast. Told you you'd groan! "Sheet in, more downhaul, tighten the foot, what's the mastbend like?" "Quick - more on the runner, where's the Viva cat? "behind us", how deep is it Ian? 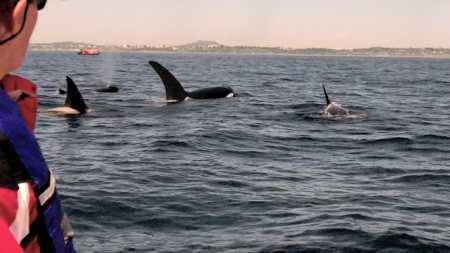 ", "only 12ft", "what's that kelp ahead? how fast are we going, "18 knots", "I can't release the mainsheet, dump the traveller!!!!" "No, I can't luff because of the rocks, what do you mean the furlers jammed!!! where's that kelp now?, s**t the Viva's overtaken us." And so on to the finish. Here are the results. 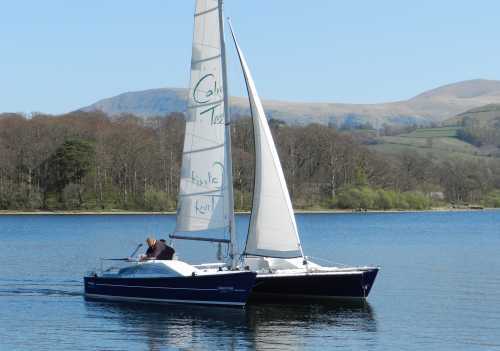 We have just been day sailing our Strike 18 and working on new designs. In particular on the new Strike 15, which is currently being built. 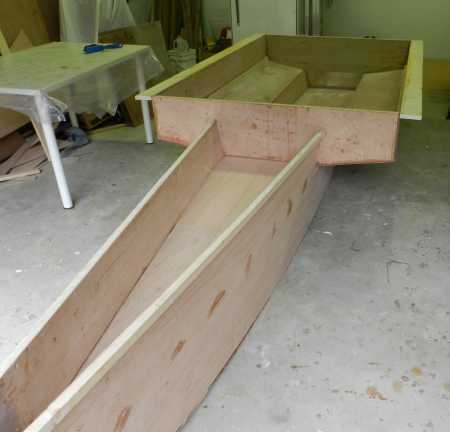 Cutting out the panels, gluing on the framing, making and fitting the daggerboard case took about 25 hours. Then the assembly of all the parts ready to glass took 12 minutes. I spent a wet weekend looking through our old sailing videos. There will be more to come, but this one of us sailing past the Statue of Liberty on our Eclipse is one of the most dramatic. In a couple of weeks I will be away for the weekend and camping on board our Strike 18, so we made this tent. It works well and keeps the cockpit dry, even in a recent severe thunderstorm. It hooks down at each beam box and to the centre of the outriggers. 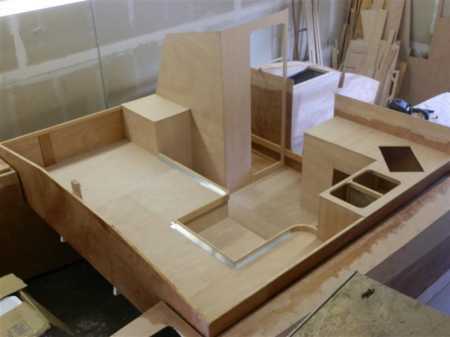 The plywood removable cabin is almost finished (no hatch yet) and so is still to be fitted. Two Strike 16's have recently been launched. 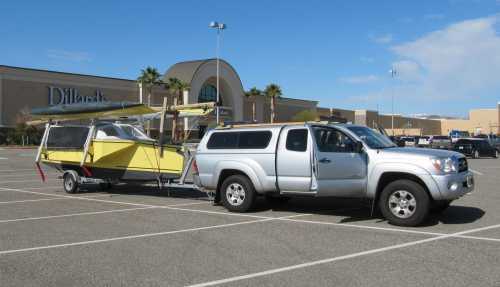 Sailing photos will, I hope, be coming soon, but, for now, here is a trailering shot. A somewhat longer load than would work in Cornwall! One owner reported "I finally got my Strike 16 into the water last week. In summary, I expected it to not feel very nimble in comparison to the original SeaSpray cat, but it actually maneuvers quite nicely. I don't have the jib cleats yet so when sailing alone I can't use the jib but it still tacks which surprised me. Perhaps not super fast. My top speed this weekend was 8.4 mph, but I expect I will get higher with more consistent winds later this year. It works well for my family." Note: this Strike is sailed on a mountain lake at 7000ft where the air pressure, and thus driving force, is less than at sea level. And this one shows the same thing without using the jib. OK it was slower, but it still went round and round. 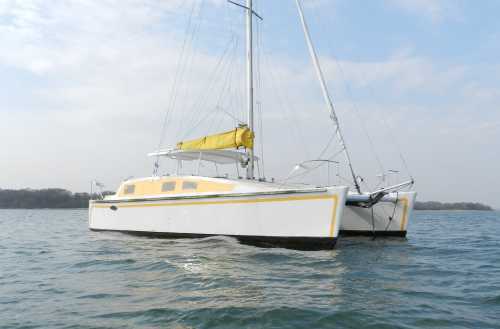 Yet if you check back on my earlier Strike 18 videos you will see the boat sailing "hands off" on it's first ever sail. 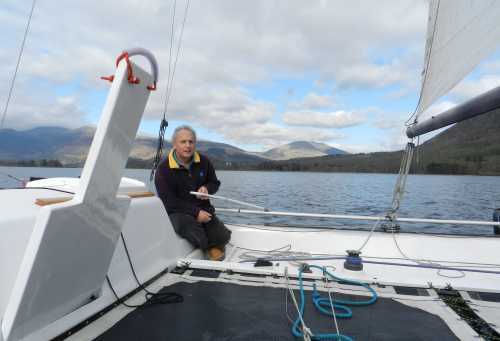 And in a later video sailing at 8 knots in 5 knots of wind with the tiller balanced on my thumb. 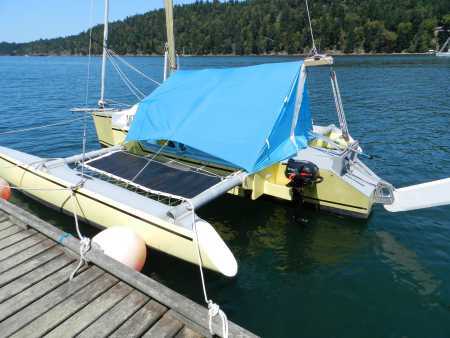 Not all multihulls are unresponsive or unmanouverable! In early August I crewed on a F24 in a local regatta. I sailed about 25 miles to the regatta on our Strike 18 and lived on board for 4 days under the cockpit tent. We then packed up the Strike 18, the part built Strike 15 and our house for the winter and drove to Port Townsend, Wa, USA to the Wooden Boat Festival. With no boat to exhibit this year, Jetti and I were volunteers. Somehow Jetti ended up running the bar while I was on garbage detail. Not sure how that one worked out! Next year we plan to to exhibit both the Strike 15 and the Skoota 28. With no boat of our own to sail I had to crew for others. First in a local race on a Thunderbird 26. We finished second, even though it was the first time in 15 years that I had worked the foredeck on a monohull. Then a day cruise in a Caledonia yawl (open decked 18fter) and a junk rigged 18ft Alacrity, built in the UK in 1965. I thought the yawl was a poor windward performer until I sailed the Alacrity! This was the first time I'd ever sailed a junk rigged boat. I knew it wouldn't sail well, but I was very disappointed to find that it hardly went to windward at all. And I was equally surprised by the number of lines that dropped into the cockpit on every tack and gybe. Very dangerous I thought and I can see no reason for fitting such a rig on any boat. 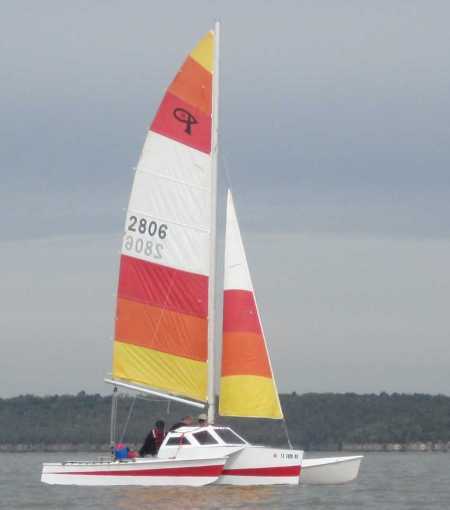 In early October I flew to Lake Eufaula, Oklahoma right in the middle of the USA to help run Sail OK, a few days of small boat sailing, racing, demonstrating and lectures. 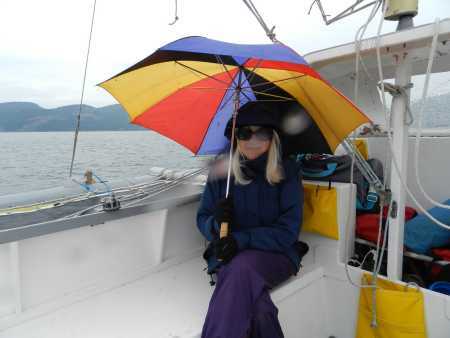 The first day was perfect sailing weather, but then not one but two cold fronts passed over us. The temperature dropped from a pleasant 26C (85F) to a less pleasant 12C (55F), then 8C(45F) , then 4C(37F). And you can guess which was the day I demonstrated the capsize recovery tests! 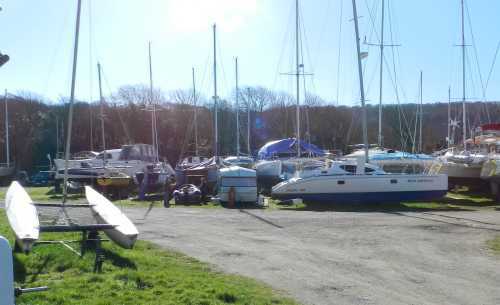 The owner started assembling his Strike about noon, launched before 1pm, took me and several other interested people out on sailing trips, took the boat ashore, packed it up and left to drive home again at 4pm. 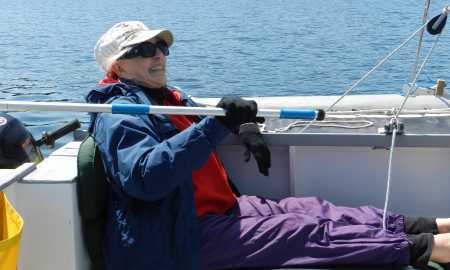 If nothing else it showed the Strike was a genuine trailable daysailer. After the meeting I flew to the UK for work and meetings. But I did find time to sail. 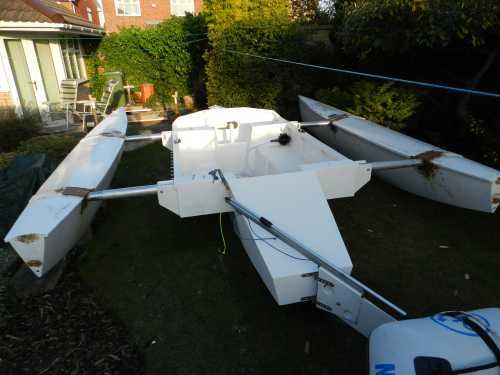 Twice in Lasers (once in a local race, which I won despite not having raced a Laser for nearly 15 years), once in a Walker Bay 10, and also in a 24ft monohull and a 43ft catamaran. So in six weeks I sailed ten different boats in five locations, and three countries yet not one boat was mine!